Welcome to GVC's "Taste of the Track"
Have you ever thought about taking a HP Driving School on a world-famous racetrack, but for one reason or another haven't pulled the trigger? Maybe the opportunity never arose, or the timing was bad, or you think you don't have a suitable "track car". Maybe you just weren't willing to shell out hundreds of dollars in fees, let alone the cost of lodging and meals, to spend an entire weekend of your precious time at a driving school when you have no idea what a HP driving school is all about, or whether it's something you would actually enjoy taking. Well, GVC has a program just for you! Taste of the Track is a low-pressure, low-risk, and low-cost introduction to the sport of high-performance driving, open to members of the BMW Car Club of America. Unlike a typical two-day HP driver’s school, it only takes up an afternoon of your time. You won't need to shell out for one or two nights in a hotel, a couple of days of meals out, or three or four tanks of fuel for your car. Because Taste of the Track is run on a Friday afternoon on the first day of a regular three-day weekend driving school, you will not only get to see a full-scale driving school in action, but also directly experience the thrill of driving with your own highly-trained instructor on one of the most famous race tracks in the world. Taste of the Track begins with check-in and on-site tech inspection at 11:00 AM, followed by a meet-and-greet with your GVC instructor and driving school staff over complimentary lunch in the WGI Media Center. After lunch, you and your fellow "rookies" take a short guided tour of the track facilities and driving school paddock on the way to "ground school" in the Kendall Garage. First there’s a brief Driver’s Meeting (mandatory at all driving schools). Next, the group attends a classroom session specifically geared toward Taste of the Track first-timers to go over the basics of high-performance driving, as well as driving school safety regulations and procedures. After "ground school" the fun really begins! You will hop into your instructor's car for a short ride-along on the track to familiarize you with the layout, and let you experience how a skilled, highly trained driver safely negotiates the Glen’s historic 3.4 mile-long road course at speed. Then, you come back to the paddock to switch into your car for a half hour session driving the track with your instructor coaching you from the passenger seat. 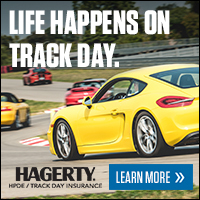 You will learn about how to safely enter and exit the track, where and when to accelerate, brake, and turn according to the fundamental techniques of HP driving, all at a pace you are comfortable with. At the end of the session, the group reconvenes in the classroom for a debriefing session, where you can share experiences with your fellow drivers, instructors and staff. Use of a loaner helmet (if you bring your own, it must be rated Snell 2010 or 2015, SA or M). 11:00 AM – Arrive at the track for check-in and on-site tech inspection (NOTE: On-site tech is simply a review of your pre-event tech inspection form to verify that it accurately reflects the condition of your vehicle; a complete pre-event tech inspection is required within the month prior to the event). Bring completed pre-event tech and med forms, and your helmet if you have one to check-in. If you plan to use one of our loaner helmets, you'll be provided with one at check-in. 12:00 PM – Meet-and-greet over lunch* with your instructors in the Media Center cafeteria. *Note: Buffet lunch is included in the price for ToT participants. Guests may purchase lunch for $12 (cash at the door). 1:00 PM – Brief tour of the driving school paddock and Kendall Garage area. A good time to use the facilities! 1:15 PM – Driver’s Meeting: Track rules (passing zones, passing technique, point-byes), flags and their meaning, getting your car ready for the track (tire pressures, wheel bolt torque, etc.). Registration limited to 12 drivers! ToT is a very popular program, so don't delay, sign up today.